Given George Lucas' fascination with myth, it's meaning and role within society and the psyche of the individual, perhaps such a comparison should not come as a surprise. This analysis by Kristian Evensen (only a small part of the opening is published here, follow the link for the whole thing) is fun and perhaps a good way to introduce people with no familiarity to the Ring to it's complexities. The film trilogy [N1] by George Lucas and John Williams, Star Wars, consisting of Star Wars, released in 1977 (sometimes referred to as A New Hope or Episode IV), The Empire Strikes Back (the Empire), released in 1980 and The Return of the Jedi (theJedi), released in 1983, represents major turning points in cinematography, as well as in film music, film sound, visual effects and other areas. The opera tetralogy by Richard Wagner, Der Ring des Nibelungen, consisting of Das Rheingold, Die Walküre, Siegfriedand Götterdämmerung, composed from 1848 to 1874 and produced theatrically for the first time in 1876, represents major turning points in the history of opera, as well as in orchestral music, the art of singing and the production of operas. It may seem strange to connect two so very different works of "art". The one, Richard Wagner's Ring is undoubtedly the peak of musical romanticism, and by many praised as the greatest work of art ever produced. The other, the Star Wars film trilogy (which recently became a tetralogy, and is later to become a hexalogy) is a purely commercial product of the American film industry, by many not counted at all as a work of "art". It is obvious that the differences between these two cultural phenomena are many.The difference of the greatest magnitude may well be represented by the economic aspect: The Star Wars series are among the top box-office hitsin the history of the cinema. (Worldwide they are nos 2, 7 and 8 respectively, adjusted for inflation. [As of 09/2004][N2]). As such, they must be counted among the most commercial successful products ever. The Ring, on the other hand, lacks this sort of statistics, but it is unlikely that the work has ever raised any profit at all. In all probability, all productions of this work in its history has resulted in net deficits. Many will count the Ring as high or high-brow art, and the Star Wars trilogy as low or low-brow art. This distinction will not be discussed here, as it seems to be irrelevant to the present discussion. There is one central premise, however, that unites the two works: The interest in myths. Wagner's Ring was certainly an attempt to reinterpret, re-present, and even to analyse several of the Teutonic, northern European myths, as well as a tremendously successful attempt to create a new myth for the modern man. Star Wars may lack the analytic approach of Wagner, but it shares the goal of representation and creation of a new, accessible, mythical world. The enormous success and the huge cult following is proof enough that the film series to a large degree has succeeded in this. More than 20 years after the initial release of Episode IV, the Star Wars series is a daily, living presence in the minds of thousands of people; it has indeed become a modern myth. If one accepts this interest in myth as a common, general premise for the two works, it becomes interesting to connect and compare the works, to investigate the possibility of common traits. As will be seen, there are quite a lot of those, and several of these concern points of the greatest importance to the respective works. Which specificmyths, historical and fictional material that has been sources of inspiration and interest from Wagner and Lucas, is not elaborated here. This article will discuss connections on three different levels. First, the structural identities, both in the respective works, in their processes of production and in their reception. Second, the thematic identities, both in the use of sub-narrations and in the use of symbols. Third, the musical identities, both in the way the music is connected to the text and the action, and in the structure of the music itself. Films and operas normally appear as single creations, they are conceived and produced as single objects. The idea of a connected series of operas, or of films, is not unheard of, but it is (at least until recently) very rare in the case of films and extremely rare in the case of operas. The huge project of Der Ring des Nibelungen consists of four great (and three of them: long) operas, thematically connected and conceived as a single work - encompassing 15 or 16 hours of music and scenic action. This singular project was realised after years of planning and work. In the whole literature of important operas, through the whole of the history of music, there is nothing remotely like this project when it comes to temporal dimensions and ambitiousness of scope. The project of Star Wars was originally conceived as a series of nine films (nonology), was soon realized as a trilogy, and is now, after years of planning and work, in the process of becoming a hexalogy (six films). Film trilogies (or longer series) are rare, and although they exist (The Godfather, Alien) they are almost never originally conceived, planned and realized as a thematic and narrative whole. The rule is more often that new films are added according to the expectation of more profit. A film series like Star Wars with ultimately six movies - encompassing maybe around 12 or 14 hours of film, must be unique at least in the context of major films. Both the Ring and the Star Wars series share the unique positions in their respective media of projecting a thematic and narrative continuity over unprecedentedly long spans of time. It is no small feat just to realise works of this dimension. It is interesting to note that both processes of creation were undertaken in a non-linear, "U"–shaped way. The film trilogy was initiated with Episodes IV , V and VI, whereafter Lucas worked himself backwards withEpisode I, more than two decades later, and is now planning to work forwards with Episodes II and III. 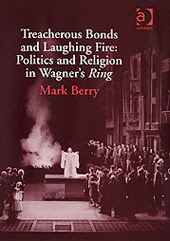 The opera tetralogy was started with the text for Götterdämmerung (originally: Siegfried's Tod), whereafter Wagner worked himself backwards with the texts, then forwards with the music until completion more than two decades later. Both works create their own World, both Worlds are supposedly in the past, the characters of both Worlds seem just the same known and contemporary to us. Both Worlds are richly endowed with details like different creatures, relations between these, descriptions of different societies and environments, stories and reports from the past, new and old conflicts, new and old hopes. In both cases we are without preparation thrown into such a World - which has to be, and generally will be, accepted unconditionally in order for us to join the "journey". One obvious example of identity in this context is: A gallery of aliens = a gallery of gods, dwarves etc. In Star Wars there is a large gallery of creatures and characters from different planets, with widely differing physical appearances and sets of behaviour. Examples are talking robots (C-3PO), a talking feline creature (the Wookie Chewbacca), the small, desert-dwelling Jawas, the large, evil Hutts (Jabba), the small, forest-dwelling Jedi (Yoda), the human heroes (Luke) etc. In the Ring there is a large gallery of creatures and characters from different parts of the world, with widely differing physical appearances and sets of behaviour. Examples are the mermaid-like Rheintöchter (Rhinedaughters), dwarves (Alberich and Mime), giants (Fasolt and Fafner), gods (Wotan, Freia, Brünnhilde), half-god/half-element (Loge), half-god/half-human heroes (Siegmund, Sieglinde and Siegfried), human (Gunther, Gutrune and Brünnhilde again), half-dwarves (Hagen), dragons (Fafner again) etc. Both Wagner, as composer and producer of his own operas, and Lucas, as screenwriter, director and producer of his films, show a need for total control with the end product. Lucas creates his own film studio, his own company for creation of new and revolutionary visual effects (Industrial Light & Magic, founded in 1975) and his own standards for sound and image (THX). Wagner creates his own theatre (the Feststpielhaus in Bayreuth) in order to realize his ideals concerning the visual and auditive effects. In Star Wars Lucas uses newly developed computer techniques to create special visual and auditive effects.Star Wars was the first film with a world-wide distribution to use the new Dolby stereo-optical sound system, a system which later has made possible the many surround systems. In the Festspielhaus in Bayreuth, the theatre built to present the Ring in the best possible way, Wagner hides the orchestra, both to create a new "sound" and to achieve a better balance between singers and orchestra. By hiding the orchestra and by turning out the lights in the theatre, Wagner also ensured a much better visual illusion than what previously was possible in theatres. He also introduced a whole range of new sound effects, from hidden bells to construction of new horns (the Wagner tuba), from the masterful balancing of voice and orchestra by orchestration to the special architecture of the hall. (Again, the hidden orchestra, and the wooden construction turning the hall into a huge musical instrument with the audience inside!) Bayreuth was the first, and is still the only place with such a placement of the orchestra. Lucas' need to establish new standards for sound and picture has led him to develop the THX standard for reproduction of sound and picture in cinemas and in home video systems. This is a clear parallel to Wagner's need to control the quality and balance of sound, and the quality of visual presentation in his opera house in Bayreuth. The Ring and the Star Wars series represents important cultural phenomena. Indications of this is the tremendous cult following of to both. An expression of this cult following is the fact that a large number of people were willing to pay the entrance fee for some random film, only to watch the trailer for Star Wars Episode I, and thereafter leave the cinema hall. This was done waiting for and in expectation of the real thing. The parallel here is Wagner's presentation of parts of the Ring as one man shows for an inner circle of friends and followers. This was also done waiting for and in expectation of the real thing. Another example: Tickets were bought weeks in advance of the premiere of Episode I, and hundreds of persons slept out in queues for several days in order to secure tickets. This compares with the need to order tickets for Bayreuth several years in advance, and the hour-long queues with persons having only a little hope of getting a return ticket for an already sold-out performance. Activities are one thing, reception is another. It is an easily observable fact that supporters of the Star Wars series tend to count these films as the best films ever made. An example of this is a poll taken among Norwegian internet users recently: The question was, which film did one count as the best ever? Of those who took the trouble to cast their vote, the overwhelming majority voted for Star Wars! It goes almost without saying that many of those who appreciate the music of Wagner count the Ring as the greatest work of music theatre, possibly the greatest work of music ever, - some would claim, even the greatest work of art ever! Adherents of both works tend to be engulfed to such a degree that they seem to live in and identify with these, and they repeatedly relive the same works. The present author has tried this with both works and can confirm the subjective similarity in the form of extreme identification, the totality of and the extraordinary intensity of the experience and the need for repetition. This section will investigate some themes which are common to the two works in question. There are lots of parallels, not only in the general choice of themes, but in several interesting and significant details. Some parallels may be expected, others may be surprising. The level of detail where identities appear is entirely unexpected, and this is what prompted the present author to write this article. a) He has cut off a branch of the world ash tree in order to make his spear, the spear of runes and of contracts - and in order to rule by these contracts and their protection by the spear. b) He has made a deal with the Giants which he doesn't intend to keep: He has granted the goddess Freia as payment for their work of building Walhall. He has yielded to "the Dark side of the Force" and ended up as Darth Vader, a tool for the evil Emperor. Wotan's daughter, Brünnhilde, and Wotan's grandson, Siegfried, have to compensate for Wotan's sins by going against his will. They succeed through their love for each other, and Wotan and the gods perish. Siegfried and Brünnhilde sacrifices their lives. Annakin's daughter Leia and his son Luke, have to compensate for Annakin's sins by going against his will. They succeed through their love for each other and Vader and the Emperor perish. Luke and Leia are willing to sacrifice their lives, but they (surprise!) are spared.